Posted on August 5, 2014, in Moving Forward, re-invention, Thoughts and tagged finishing, Jersey Girl Triathlon, ride, run, swim, transition 1, transition 2, triathlon. Bookmark the permalink. 7 Comments. You did it!!!!! Congrats!!! That’s the best thing to be proud of!!! Time is not an issue..you just did what so many people can’t even fathom. It’s been awesome reading your blog, seeing you prep for this..the ups and downs and then making it through. I don’t even know you except for what I have read here and yet I am really excited for you. Just know, you are an inspiration to the people around you, and hold your head high!! You’re a triathlete! Thanks Leah. It was tougher than I thought but it’s done! Congrats. Triathlete. There’s always room for improvement. You may not know it, but you are inspiring someone else. Would it be ok if I reblog your report for my readers? 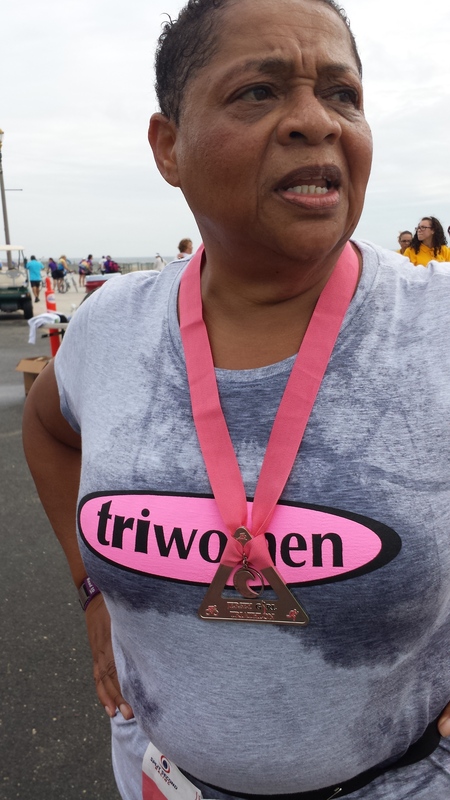 Knitting Nedjmi taking on her fears, and finishing her first triathlon. Very inspiring. Great job! I just finished my first triathlon a couple of weeks ago as well. Signed up for another already, even though (or because?) I wasn’t thrilled with my results for the first. Congratulations on finishing your race!